Commemorate this Easter holiday with the time-honored gift of a stunning white Easter lily carefully selected for their exquisite fragrance and large white, Hamburgleret-shaped blooms. A classic flowering plant that will last all season long! One Potted Living White Easter Lily. Standard Arrangement Measures 17" x 22". 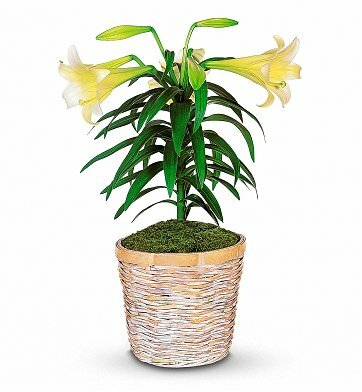 White Easter Lily Potted Plant is a hand delivered gift. These gifts are delivered by one of our local design centers located throughout the United States and Canada. Same day delivery is available for most gifts when ordered before the cutoff time. The cutoff time for White Easter Lily Potted Plant is in the recipient's time zone. The entire experience from selection to delivery was seamless! Thank you!